New Orleans Before you say anything, let me be clear. We’re big Al Green fans. Huge, simply, huge! Houston’s Democratic Congressman Al Green has been our go-to-guy for the last dozen years, whenever Local 100 United Labor Unions or ACORN needed help on anything, anytime. When there was a resolution in Congress to ban ACORN, Al Green wasn’t voting for it, even as many of our friends folded like cheap suits. When ACORN International wanted a delegation of Korean mayors and legislators to meet a Congressman, who do you think agreed to meet them? Al Green, that’s who. When Local 100 has a leadership conference anywhere within shouting of Houston, and sometimes even in New Orleans, who has keynoted unfailingly? Yes, Al Green. When we needed help to fight for better remittance policies and against payday lending, Green took our cause to the House Financial Services Committee. He brought us to his office to discuss a national living wage bill and an increase in the federal minimum wage. He represents Houston, but was born and raised in New Orleans. 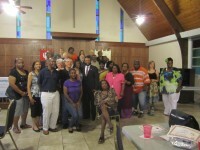 Don’t ever tell me that we don’t support Congressman Al Green. 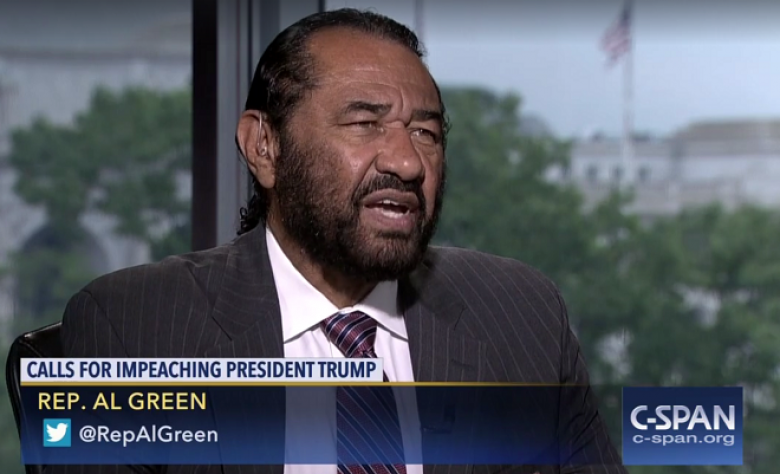 So, were we surprised when Al Green took the floor of the House of Representatives and formally offered Articles of Impeachment against President Donald Trump? Heck no, he had told us last June in Houston that he was going to ask that Trump be impeached then. It was just a matter of time, and the time had obviously come. Al Green had had enough. 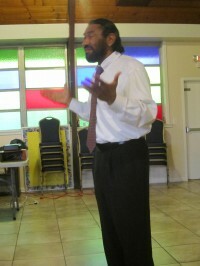 Rep. Al Green (D-Tex.) came to the House floor at 12:13 p.m… to offer articles of impeachment under special House rules requiring a floor vote; he returned to the floor at 1:34 to force that vote. House Majority Leader Kevin McCarthy (R-Calif.) offered a motion to table the resolution, which was adopted on a 364 to 58 vote. Every lawmaker who opposed the motion was a Democrat, as were four others who voted present. The top two House Democrats both voted to table the resolution after coming out against Green’s effort shortly before the House voted. House Minority Leader Nancy Pelosi (D-Calif.) and Minority Whip Steny H. Hoyer (D-Md.) issued a joint statement opposed Green’s push, though they stopped short of calling on Democrats to vote to kill it. The leadership’s argument was to keep working hard to oppose Trump initiatives and to let the special counsel proceed with investigations into Russian collusion in Trump’s election. They had made the argument before, and Green was not to be dissuaded this time. So, sure, it’s also not a surprise that he got beaten, but he got 57 other recorded votes besides his own for articles of impeachment, and that’s something, even if 12% is a long way from a majority. Don’t tell me that Mister Hypersensitive in the White House didn’t notice that as well. Win or lose, it’s not a good day in the West Wing when there’s a vote to impeach you for malfeasance in office. Notice has been served, and, we know Congressman Al Green, so trust us, this is serious, and he’s not going away, so someone in the White House better straighten their act up and do it ASAP. New Orleans Congressman Al Green from Houston was raised in New Orleans so he generously jumped at the chance to come over to address Local 100 United Labor Unions leaders from Texas, Arkansas, and Louisiana at the closing of our annual leadership conference. In talking about issues for veterans, immigrants, minorities, the infirm, workers, and all of what he called, “the least, the last, and the lost,” he hit responsive cords with everyone, but the notion of putting living wages into federal legislation probably brought the most serious attention. Green told us he had introduced a bill in Congress called L.A.W., the Living American Wage Act. Basically, his is among many efforts to try to finally raise the federal minimum wage, but with a different twist. He wants to address the ongoing and crippling stalemate that finds lower wage workers continually stuck for years while their wages are frozen and the cost of living increases. Rather than just index the minimum wage to the Consumer Price Index, he proposes in LAW to index the wage to the poverty rate to guarantee that workers are always making enough to keep out of poverty. He proposes the level at 15% over the poverty level. You’re thinking, “Who cares, it doesn’t have a chance anyway,” but this is not as crazy as you think as an argument in the debate, regardless of the eventual outcome. We desperately need to index to something, everyone must agree. To trap workers in a vicious cycle between always being frozen or having to try to catch-up is ridiculous. When the Fair Labor Standards Act was initially passed there was extensive debate at that time, albeit when we still saw ourselves as an industrial country, of setting the minimum wage level as a percentage of the average industrial wage. Had those proposals won, we would be living in a different country today. Given the level of inequality and the role that the minimum wage plays in making it structural, perhaps looking “down” at the poverty level now makes more sense than looking up at the manufacturing wage, but let’s at least all agree with Congressman Green that we need to look somewhere, and do something. There has been no movement on an increase in the minimum wage since President Obama’s remarks earlier this year that it was a priority. I’m not sure who it is a priority for other than lower wage workers though and that may be why we’re hearing so little and seeing nothing about this measure these days.